Inline sander, Sioux Force dual piston inline sander. Abrasive sheets for this sander are shown on our Cut sheets page. For additional sanders, please see our DA, random orbital , Palm sanders , Pistol grip sanders , and Right angle sanders pages. SAFETY WARNING: Make sure the SPM of the sander you choose below, does not exceed (is less than) the maximum SPM of any accessories you use with that tool. 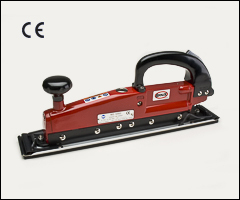 Inline sander, 23/4" x 17"
Sioux Force dual piston design keeps extra power in the reserve to prevent any stalling. Good for smoothing down body filler or shaping and leveling large flat surfaces. No swirling of surface. Smooth, reliable power. Dual handles. Quick lock paper clamps for fast changes of 2 3/4" x 17 1/2" sheets. 0.45 HP, 3.0 CFM @ 90 PSI, 1/4" air inlet, 3/8" min hose size, 16" high, 6.8 lbs.